Now seems like a good time to reflect on the year that's just passed. 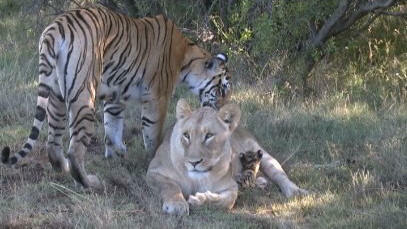 In January 2009, tigress Julie gifted us with 3 cubs, Sunda, Zaria, and Shine A Light. Hundreds of people have walked with them, photographed them, swam with them, and been inspired by their beauty. These 3 ambassador tigers, have enthralled, and inspired people from all over the world. I said that we would only walk with them for a year, but I have decided to extend this for a further 2 months. Regrettably, no children under 12 can walk with them now, as they are just too big, and too strong. Unfortunately I have also had to stop the swimming as the tigers get too excited in the water, and us humans with our thin skin, and high centre of gravity are easy targets and get smashed into sharp rocks. Fortunately myself, and R100,000 worth of movie camera have been the only real casualty this year, everyone else remained unscathed. A 400ha area is being fenced off and stocked with game for Sunda, Zaria, and Shine so that they can continue their hunting education and become fully-fledged, self-sustaining tigers. On the 1st November 2009, Julie produced 5 cubs, of which 1 is white, and 4 are normal in colour. At time of writing, 4 are doing extremely well, and one, the runt called "Runti", a small female, will probably not survive. Nature takes care of the species, not the individual and the runt in a litter of 5, is expendable. However, to standby and watch the tiny cub fight for its life, is an incredibly hard emotional experience. One morning "Runti" follows Seatao, her father, but he has no milk. Then she snuggles up to Savannah, but once again, no milk is forthcoming. She comes right up to my vehicle, pleading for help, but I have nothing, then she gnaws at an old bone, trying to extract some protein to keep her going. When Julie suckles the cubs, "Runti" gets pushed away from the teats by the bigger cubs. However, there are long periods where "Runti" has the teats to herself, but for some reason, she doesn't put on weight like the other cubs. I will end this newsletter by telling you a short story. I am in thick reeds in the riverbed below the den. Julie is lying 10 feet away with the cubs peering cautiously out of the reeds. Julie strolls up to me, and flops down on top of me while at the same time licking my face for almost 3 minutes before falling asleep. The incredulous cubs decide that I must not be of any danger, for they waddle out of the reeds and begin to suckle. From my position under the tigress, and not wanting to disturb the suckling cubs, I gently place my bean bag on top of Julies back, and then place my camera onto the bean bag. Thank goodness for the reversible screen on the Sony EX1, for from my position, I can maneuver the camera to capture the suckling cubs. I leave the camera rolling and there is a noticeable up, and down movement of the camera as the sleeping tigress breathes heavily. As the 5 cubs compete for the 4 teats, one cub knocks the camera off the sleeping tigress, and from under the tigress I do a self-interview. The human voice intrudes into the peaceful scene. Several cubs immediately begin to hiss, and snarl. I go back to a soft chuffing sound that I have learnt from Julie. The cubs are instantly calm and one even move closer to see if I have any milk to offer. With the big, dark, dangerous eye of the camera lens gone, the cubs grow bolder. One chuffs me from 6 inches away, and another breathes into my ear. Julie remains asleep, and breathing heavily. Only 2 hours later, with the hot sun beating down on us, does Julie waken and move into the shade. Finally I can move into a vertical position. One of the most incredible film shoots is over. The feeling is indescribable, I feel like I've had 3 massages, meditated, and done yoga for an hour. My spiritual body has gone to heaven (or am I in heaven?). I definitely feel that for the last few hours I have been in the presence of greatness, in the presence of a higher being, certainly one of the most spiritual moments of my life. I leave you with this reminder in 2010, tigers in the wild will go under 1000 and human beings will exceed 7 billion people and www.jvbigcatsco.za website will exceed 1 million hits. Thank you for all your support and a successful new year to you all. Is there any possibility to feed her while leaving her with her mother? Maybe little runti has tapeworms or other parasites, that would be remedied with "slipped in" medication? You can't separate human and animal emotion, because that language is universal, and I think the tigers know perfectly well about your emotional involvement and what you might or might not do for them. However, I don't envy you for the decision to be made. Conservationists don't just breed in order to keep the numbers up, it's also about conserving the animals way of life. If John were to pick Runti up and take it away from it's mother in order to save his life, he could end up being alienated from his family because he's got human scent all over him from being handled. Even though they are in ... See Morecaptivity they are still wild animals that will never truly trust humans. It cannot be easy for these people to watch,do you honestly thing they as conservationists enjoy watching this creature suffer? But it's just how life goes sometimes. You need to stop thinking about the one creature because the ethics run deeper than that. It is really sad and we pray that Runti gets through this, but there's a chance it may not...and if that happens and you feel something needs blaming, blame the people who started this mess and not the people trying to stop it! 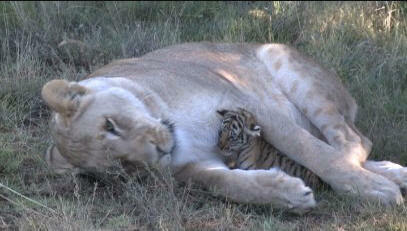 This song by the Parlotones - Perfect Place - I dedicate to you, little tiger. Tiny buttercup, won't you take my hand? Sometimes, we wonder whether it's any good to intervene if the poor creature can't help itself and probably won't grow up to be a gorgeous, self suficient tiger. But, on the other hand, can we just stand and do nothing? I know I can't. She looks frail, but - what the heck!? - she's alive. Please, give her a chance. If she dies because there's nothing we can do, that's the way it is. But don't let her starve. JV if you could give Jamu(the orphaned leopard) and Shingalana the lion cub a chance @ life by hand raising them, why not give this li'l one an opportunity too??? I dont understand how is it that helping this cub in distress is interfering with nature whereas handraising the others was ok. Come on JV you have done so much for the animals over the years, please don't let this precious cub be lost FOREVER!!!!!!! 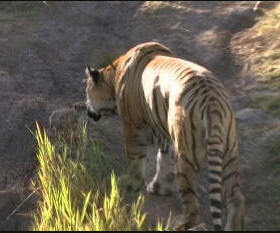 Is the cub still alive - or are you going to film some more for publicity and money? I think you have lost sight of the end goal - TO SAVE THE TIGERS - JV I CHALLANCE YOU - RAISE THE CUB, IF SHE IS STILL ALIVE - OR GIVE HER AWAY TO BE SAVED BY SOMEONE ELSE. MAYBE SHE WILL SURPRISE YOU AND LIVE AND BE COME STRONG AND FAMOUS AND MAKE YOU LOTS OF MONEY - ISN'T THAT WHAT IT IS ALL ABOUT!!! Denice - sure we all understand the frustration of the situation- we all know also that what he says is true ie in the wild she would not make it BUT of course it is not truly in the wild and instead of slagging JV off with negative insults we need to appeal to his determination in conservation and convince him to save the little lady. ... See MoreRealistically anyway Julie and Co are not in the true wild and so he needs to seriously consider saving Runty - in the real wild the others would have killed her if they followed their wild instinct and felt she was not stronge enough to live - even Savannah protected her and was concerned about her when she went under the Jeep - SO PLEASE SAVE HER REGARDLESS WE NEED HER the least we can do is save her in respect for all the tigers that have died due to HUMAN MADNESS ie eating them, hunting them, destroying their environment and basically interferring where we do not belong. Isn't the purpose of the project, conservation? Sir, with all due respect, you might be losing sight of that. I think the more animals in the gene pool the better it will be in the long term. A hundred years from now they can fight it out like nature intended. Right now each life is precious. Do your best, good sir. I agree as well,,,,there was a National Geographic I read once and it had a pic of this tiny frail child who this photographer had been following for days,,,the child was lost,, alone and looking for food and water,,,the photographer didn't help because he said he couldn't interrupt what was naturally going on,,,,the child died and then the ... See Morephotographer ended up killing his self....sad but true.....I understand what photographers and scientist try to do,,,but they have to remember lives are also involved,,,wouldn't you want someone to help,,if it was you,,or would you want them to get a GREAT Shot? It is your duty to save her, JV. This is a nature preserve, not a wildlife documentary from the untamed wilds. The purpose of this nature preserve is to rebuild the tiger population through artificial means, not to watch tigers die due to nature.